Build sturdy perches at least 4 to 6 feet from the ground, allowing enough overhead space for your birds to roost comfortably. Perches should be wide enough to allow your peafowl's feet to sit flat. 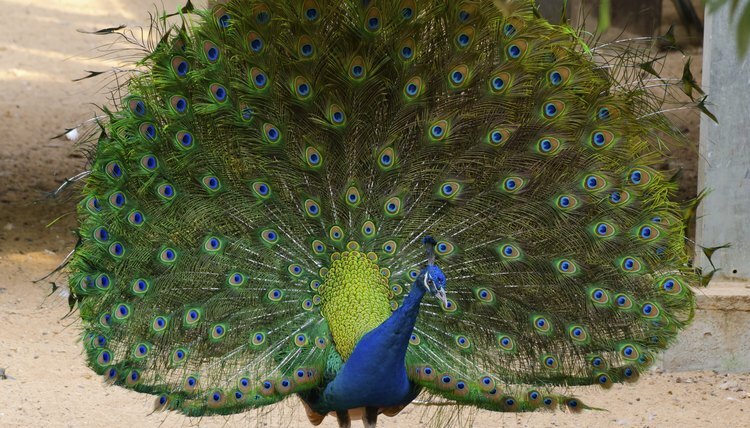 If you keep peacocks in adjoining pens, put up a 30-inch high sight barrier, such as a sheet of galvanized tin, to discourage fighting. Add food and water containers that won't tip over easily. Keep in mind your individual environment when choosing construction materials. Areas with a heavy snow load or high winds will require sturdier construction than in milder climates. Planning peafowl pens can create a challenge for the backyard bird keeper. Peafowl require substantial space, so plan an enclosure that allows about 80 square feet per bird and stands 6 to 8 feet high. While fairly tolerant of weather variations, peafowl kept in cold climates require ample protection from the weather. Some peacock pens in the coldest regions are even heated. Lay out your peafowl enclosure. Place a 4-by-4 post at each corner and along each side at 8- to 12-foot intervals. Dig a hole 24 inches deep for each post. When considering the height for your enclosure, take the depth of your support posts into account. For example, if you want your enclosure to stand 6 feet high, you need to use 8-foot posts. Stand each post in its respective hole. Use a level to ensure it stands perpendicular to the ground. Mix your concrete in a wheelbarrow and shovel it into the hole around the post. Allow your concrete to cure overnight. Frame out the top and bottom of your enclosure using 2-by-4 lumber and galvanized nails or screws. Frame out a gate opening at one end of your enclosure using 2-by-4 lumber. Make your gate wide enough to allow for a wheelbarrow. Build your gate with 2-by-4 lumber and cover with wire mesh, or buy and install a gate from your local hardware store. Wrap your enclosure in galvanized wire mesh and attach with heavy duty staples. You can use 2-by-4 galvanized mesh for the upper parts of the enclosure, but the bottom 2 to 3 feet of the enclosure should be wrapped with 1-by-2 or smaller mesh. This prevents birds from sticking their heads through and getting caught. Stretch top-flight netting, chicken wire or poultry netting across the top of the pen and fasten with staples. If you live in an area with climbing predators, use wire mesh for the roofing, since many predators such as raccoons can chew through the netting. Enclose one end of your peafowl pen with sheets of galvanized tin, including a roof, or attach a prefabricated shed to the end of your pen. Attach 12 inches of wire mesh around the bottom of your pen, flared out to cover the surrounding ground to prevent predators from digging under. Alternatively, you can pour a 2-by-12-inch deep concrete barrier around the base of your pen.